The sisters of the Presentation in Panama (province of Medellin) received them with great enthusiasm, a group of sisters stayed at the Central House and others with the group of young people at the Marie Poussepin Educational Center in Curundú identified as OP Field where they stayed young people from the Dominican family from Colombia, Haiti, Uruguay, Guatemala, Nicaragua and Panama, who, in the framework of WYD, had the opportunity to receive the Master of the Order Fray Bruno Cadoré OP, who shared a Vigil and a conversation with the young people, the religious and the friars present. It was an opportunity for a fraternal sharing and to discover from our Dominican identity to how to assume our position in the Church as young and consecrated. Pope Francis with Sr. Rosemary CastañedaIn the participation of all the programming WYD, it is worth mentioning the excellent organization of the State and of the Panamanian Church that counted with the participation from the pastoral leadership in the Local Organizing Committee of Sr. Rosemary Castañeda, Dominican Sister of the Presentation. All this good organization allowed to perceive the warmth, welcome and generosity of the Panamanian people to make each pilgrim feel at home and how they became one with the thousands of visitors. 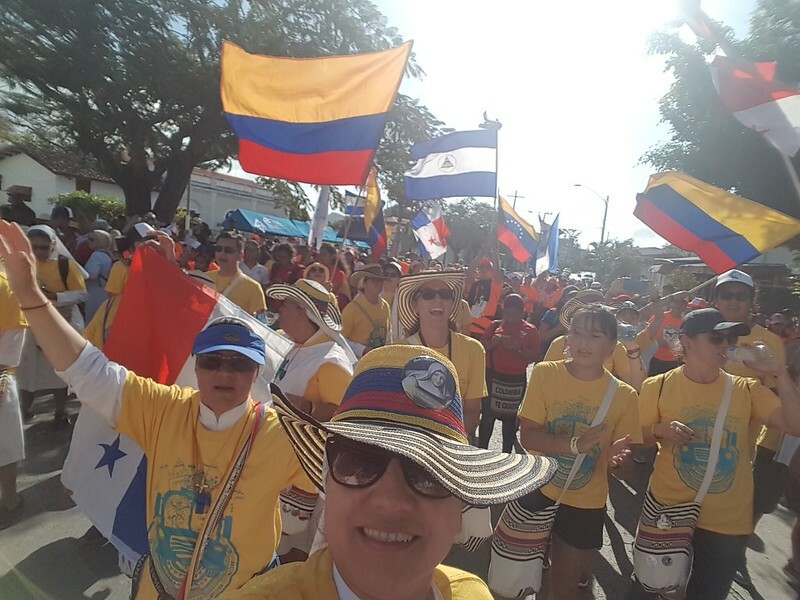 they were in the diocese of Penonomé, which dressed as a party to receive hundreds of pilgrims from different countries, they shared the Field Mass presided over by Monsignor Edgardo Cedeño Muñoz S.V.D. Bishop of the Diocese of Penonomé. The development of the days there, was marked by joy, typical Panamanian folklore, care of nature, recreation and sports; varied and fun programming that allowed to know the culture and integrate with the people of the region. In foster homes they felt in family, every detail and gesture of welcome was an opportunity to demonstrate the joy of having them at home. The group of pilgrims was more than in love with this region and the culture that with open doors and hearts overflowing with love taught them the ability to welcome of this Panamanian people. Different parishes and places of the city of Panama were meeting points for the catechesis of the bishops in the different languages during the days 22 - 25 of January. 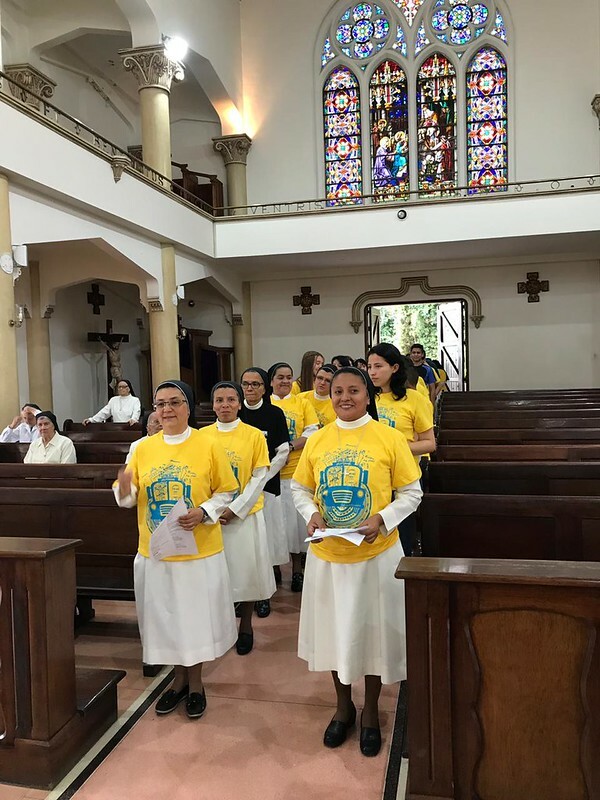 The delegation of pilgrims from Colombia and other Spanish-speaking countries participated in the catechesis at the Don Bosco Minor Basilica, in the heart of Panama. The Haitian and French speaking delegation met at the Multiplaza shopping center. All very close to the young and demanding in their preaching encouraged the young people to follow their vocation fully and safely because the Lord will always accompany them and not abandon them. The bishops insisted on the expression "Behold ..." to be attentive to the calls made by the Lord and to be able to respond in time, as did the Virgin Mary, who said "YES" to God's plan; and be like her, attentive to the needs of the brothers as she did at the Wedding of Cana and when she realized that "the wine" was missing and she tells the servants to do what Jesus tells them to do. They insisted on respect, on valuing the identity of each one, the gifts with which the Lord has created us and the service as an essential part of the vocation to the example of Mary. It took place in the Omar Torrijos park, emblematic place for the city of Panama, where sport, rest and family integration recover life, the Youth Park of the WYD was installed, central space and heart of the WYD, which brought together To young people to express their faith, meet with Jesus in the Blessed Sacrament in the MEETING TENT: where each young man could meet with the sacramental Jesus who was always exposed in adoration, with our mother the pilgrim Virgin of Fatima who accompanied this pilgrimage. To approach the sacrament of reconciliation in the park of Forgiveness: RENEW ME, a joyful experience to feel the mercy of God, the preparation for the sacrament of reconciliation, the welcome of priests and the celebration of a community that awaits you with open arms when you return to the Father's house. Likewise, it was the occasion to ask: what does God want for your life? In the Vocational Fair: FOLLOW ME, with 115 stands, with more than 60 religious congregations, lay apostolic groups and matrimonial apostolic groups. At the fair, the official launching of the DOCAT - Social Doctrine of the Church for young people was made, the dream of Pope Francis to create study groups of the Social Doctrine, learn from it and decide to transform society. It counted on the participation of recognized catholic artists who animated the fair, there could be felt an ecclesial atmosphere of unity from the diverse charisms and the force of the consecrated life, that continues seducing many young people. It was a very significant experience to be able to participate in this fair with the stand of the Dominican Sisters of the Presentation, to see the interest of many young people to know the Charism and to witness how so many people know and admire the service of the Congregation by listening to expressions towards our foundress mother as "what a great Marie Poussepin, everything she did". 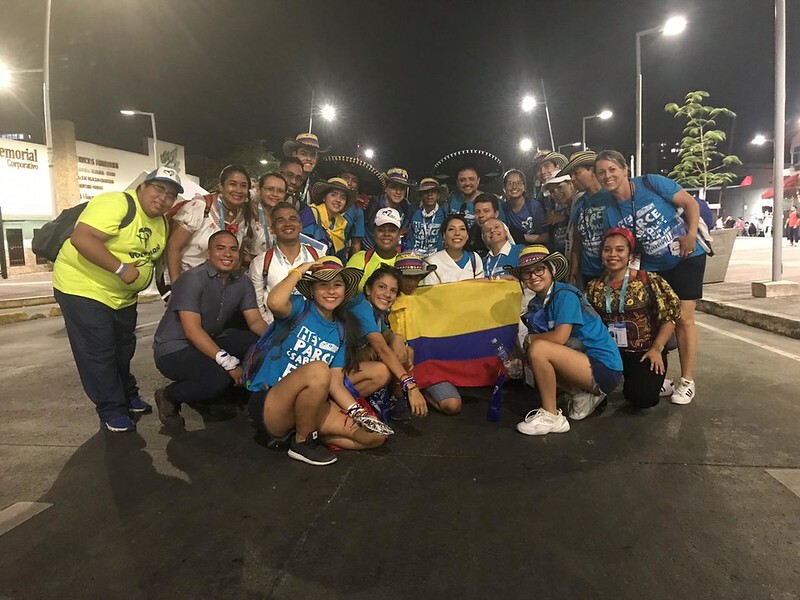 The Youth Park was an experience of encounter, unity, joy of faith and cultural expression that animated and marked the WYD 2019. With great enthusiasm and joy the young people gathered to listen to the first discourse of the Holy Father and pray with him. The Holy Father encouraged the pilgrims of WYD to "build bridges and be witnesses of the Gospel". The joy after this first meeting with the Successor of Peter ended in a party..
A strong moment of prayer for the reality of various countries, after this cross, Pope Francis invited us to pray, thus: "Lord, Father of mercy, we have accompanied your Son in the way of the cross; that path he wanted to travel to show us how much you love us and how committed you are to our lives. " Because "walking with Jesus will always be a grace and a risk: It is Grace, because it commits us to live in faith and to know it. It is Risk, because in Jesus, his words, his gestures, his actions, contrast with the spirit of the world, with human ambition, with the proposals of a culture of discarding and lack of love." With great fervor thousands of young people prayed before Our Lady and as a preparation to adore Jesus Eucharist, we heard the Holy Father's meditation: "The salvation that the Lord gives us is an invitation to be part of a love story that is interwoven with our stories; who lives and wants to be born among us so that we can bear fruit wherever we are, as we are and with whom we are. There the Lord comes to plant and to plant himself; He is the first to say 'yes' to our life, to our history, and he wants us to also say 'yes' to him. This surprised María and invited her to be part of this love story. Undoubtedly, the young girl from Nazareth did not come out on the "social networks" of the time, she was not an "influencer", but without wanting to or looking for her she became the woman who most influenced the story. Mary, the "influencer" of God. With few words he encouraged himself to say "yes" and to trust in the love and promises of God, the only force capable of making all things new." To conclude this day Pope Francis insisted that "we do not always believe that God can be so concrete and daily, so close and real, and even less so that he becomes so present and acts through someone known as a neighbor, a friend, a family member and even you, dear young people, the same thing can happen to you every time you think that your mission, your vocation, that even your life is a promise only for the future and has nothing to do with your present, as if being young were synonymous with waiting room for those who wait for their time. For Jesus there is no "meanwhile" but love of mercy that wants to nest and conquer the heart. He wants to be our treasure, because Jesus is not a "meanwhile" in life or a passing fad, it is a delivery love that invites us to surrender. Dear young people, do you want to live the concretion of your love? May your "yes" continue to be the door of entry for the Holy Spirit to give us a new Pentecost to the Church and the world. "With these words each young person received the shipment to prolong what he has lived these days."